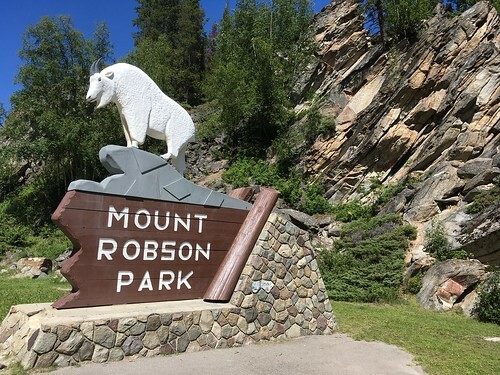 Mount Robson | What Goes With What? 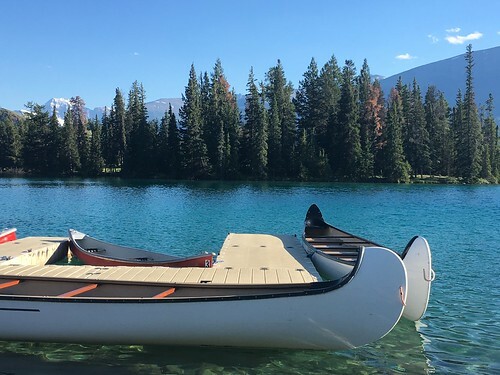 For our last day in Jasper we were looking for a simple no hiking day. 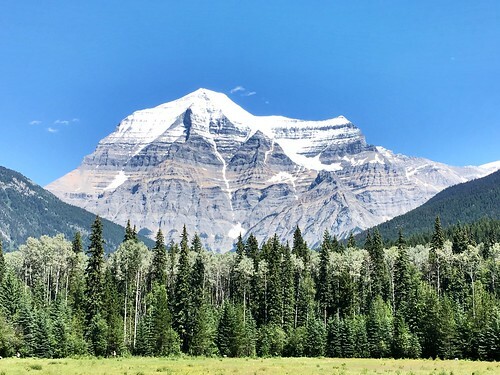 A friend suggested Mount Robson “her favorite mountain”. The hour drive west of Jasper proved to be well worth it. What a magnificent mountain! Much like our mountain in Seattle, Mt Rainer, we were blessed that the mountain was ‘out’. The locals say that is a rare occurrence. Most of the hikes here are some distance so we were content with a short walk and a nice picnic at the trailhead. One day we would love to hike to Berg Lake which is called such because of the ice bergs floating in it. On the way out of the park we grabbed an ice cream cone. Just what we needed on such a warm day. 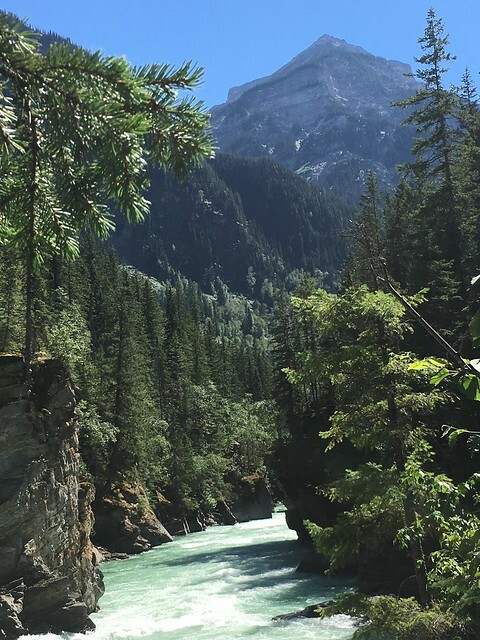 On the way back to Jasper we stopped at Ovelander Falls on the Fraser River which runs all the way to Vancouver, BC. An easy walk downhill from the parking lot to a nice viewing area. 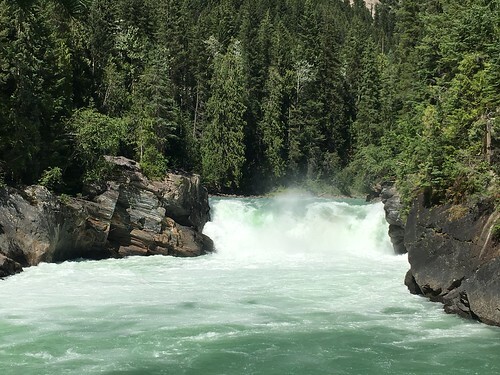 The falls are 100 feet wide and 30 feet tall. If you ask The Viking he can even tell you coordinates. LOL!!! Back in Jasper we wandered thru the Fairmont Jasper Lodge where it is rumored that Megan and Harry honeymooned. 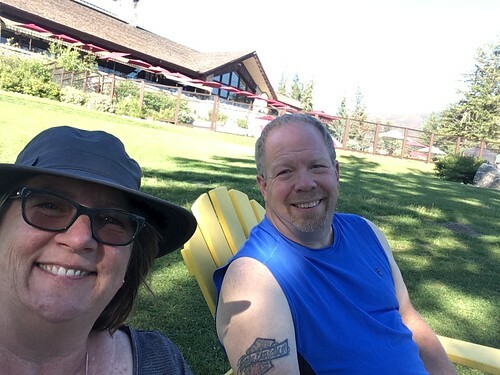 We found chairs on the lawn and had a little wine and cheese happy hour on the lake watching the canoes and paddle boards go by. Just like royalty! A great finish to a beautiful day. 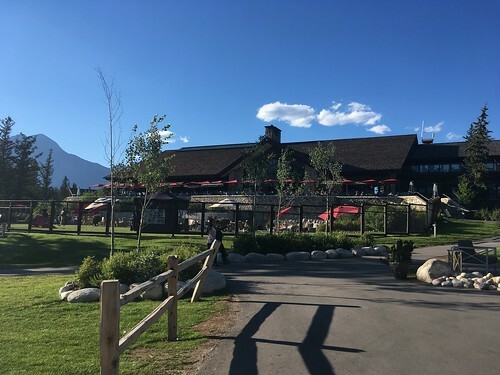 This entry was posted in Adventure and tagged Adventure, fairmont jasper lodge, jasper, jasper lodge, Mount Robson, overlander falls, road trip by Diana. Bookmark the permalink. Nice. 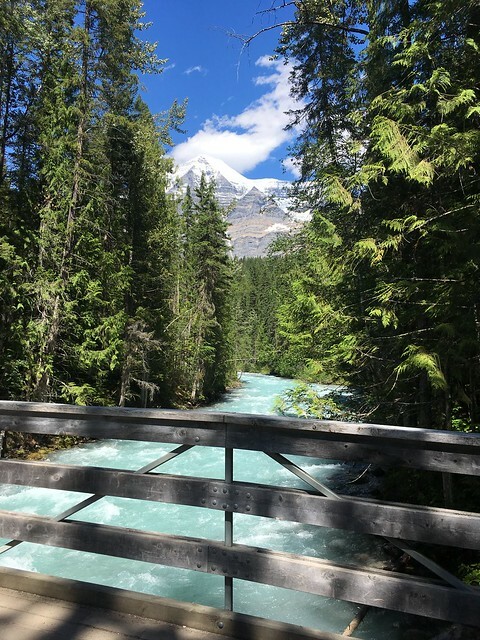 The first photo almost looks as if the trees, hills, and mountain all gathered together specifically to pose for your picture. Fantastic layering. Mountain is epic. Thank you. The mountain is epic.